Chipset upgrade - The chipset upgrade has TVS IC's installed on the outputs offering TVS (Transient Voltage Suppression) isolation on each output of the splitter. 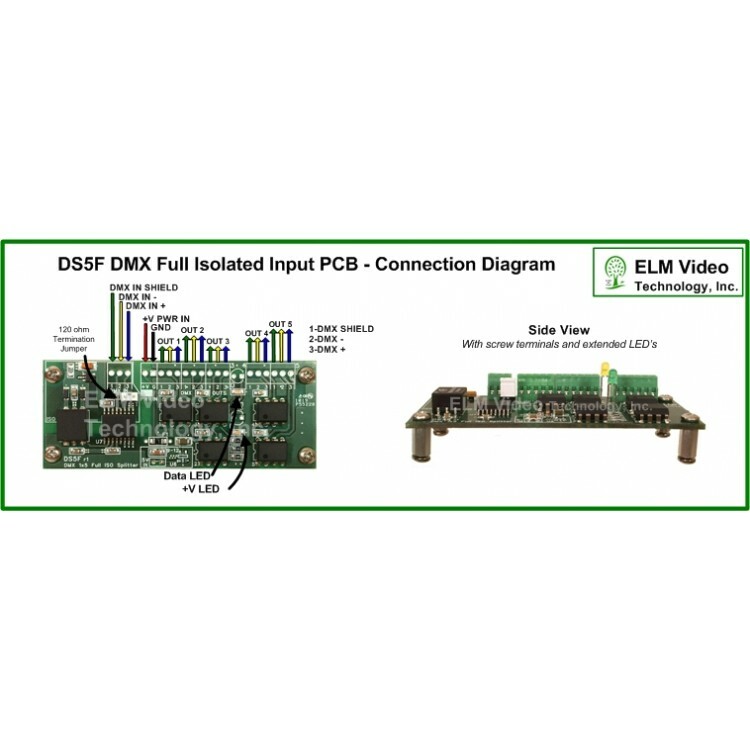 DIN Rail 35mm x 8"
The DS5F is a full isolated 1 In 5 out splitter PCB. 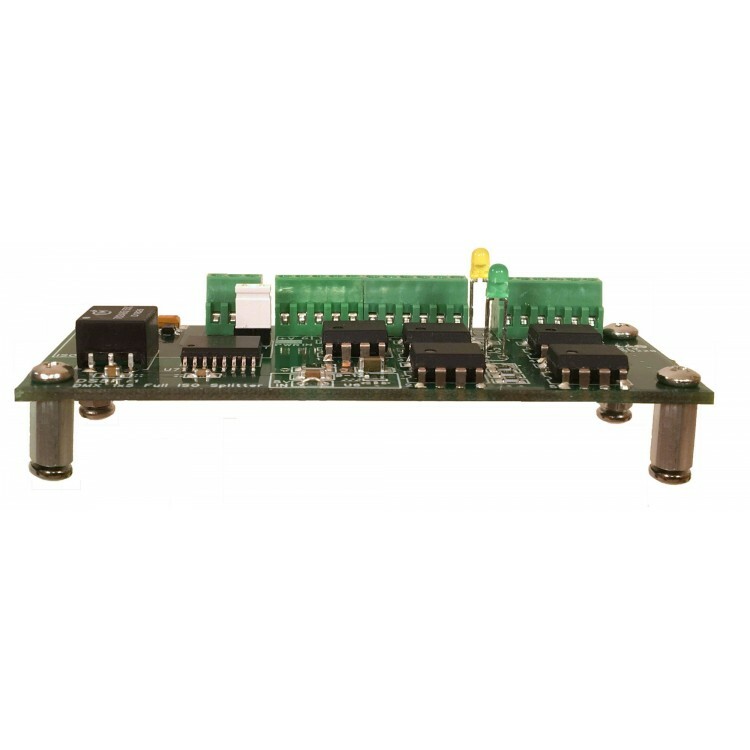 Accepts a DMX 512 input from any DMX generating device such as a DMX lighting board or PC based DMX device and creates 5 additional outputs (i.e. split, distribute, buffer, amplify, boost) that will each drive up to 32 devices. 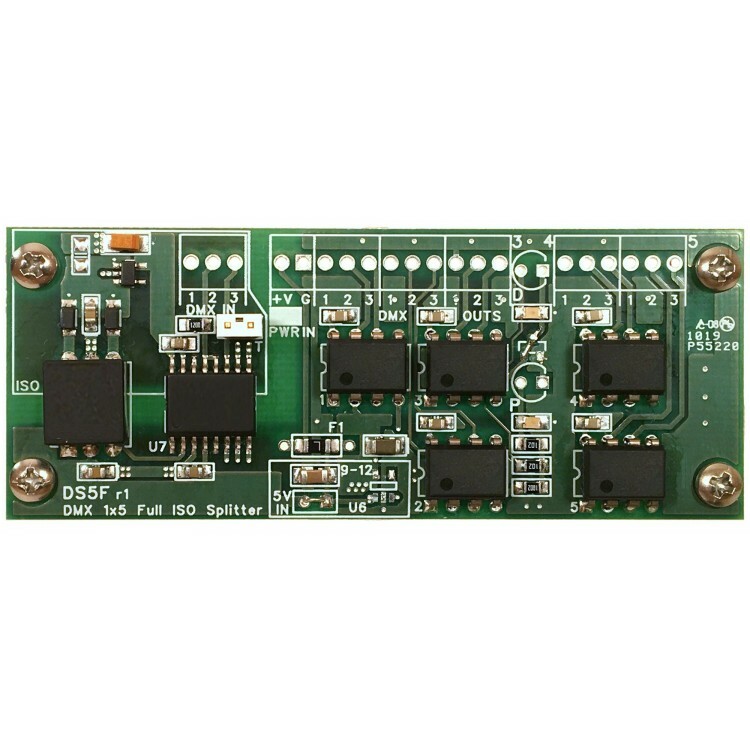 The DS5F features full isolation of the DMX input as well as the DMX input shield/ground connection. The DS5F offers full isolation without the loading of optical isolation. Several options available. Gang addtional DS5 PCBs to create as many outputs as needed. 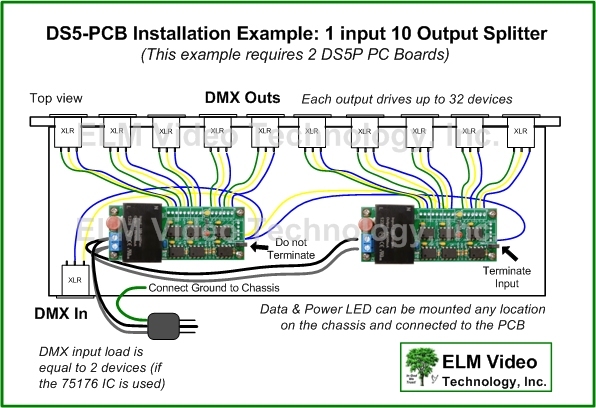 Add DMX outputs to existing installations or DIY projects. To "Add to Cart" select the LED mounting style required. Choose the Chipset Upgrade for TVS (Transient Voltage Suppression) protection on each output. Note - The outputs are separately driven and electronically isolated, not "Transient Voltage Suppressed" isolated from each other unless the CHIPSET UPGRADE is selected. 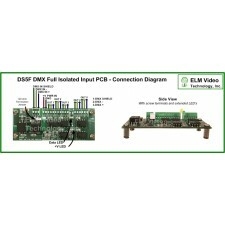 Brand: ELM Video Technology, Inc.
DMX 512 1x4 TVS Splitter is a 1 in 4 out splitter (distributor, buffer, amplifier, booster) that tak.. 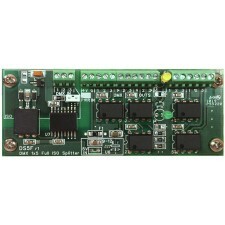 The DS4-PCB is a DMX 512 1x4 splitter (distributor, buffer, amplifier, booster) PCB with 1.. 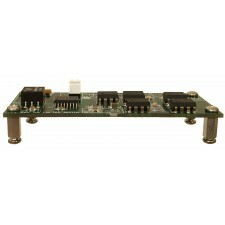 The DS5 is a 1 In 5 out splitter PCB with optional on board power supply that will accept a DMX 512 .. 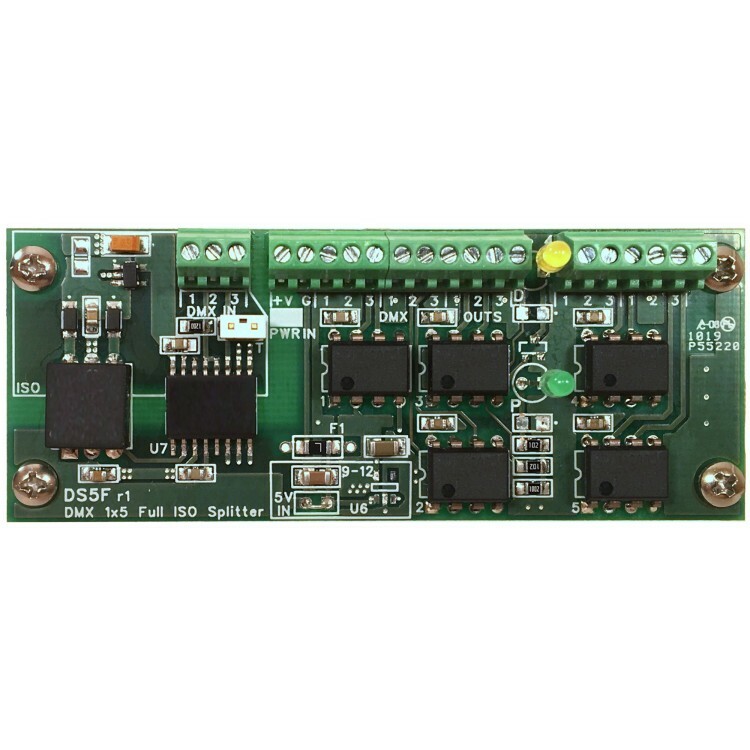 The DSI4-PCB is a DMX *Optical Input Splitter (distributor, buffer, amplifier, or booster) PCB with ..
DMX 512 Optically Isolated Input Splitter The DSI-4 is a 1 input 4 output DMX splitter (distri.. The DS8D 1 In 8 out splitter PCB that can be equipped with either a standard input circuit or an opt..
DMX DUAL 1x9 (front 1 input with 9 outputs and back 1x9) splitter OR 1x19 in a 1U 19" rack mount enc..
DMX 1x9 and a 1x4 splitter in a 1U 19" rack mount enclosure. The DSPr splitter (distributor, buffer,..
DMX QUAD 1x4 splitter in a 1U 19" rack mount enclosure. This splitter configuration has 4 sets of 1 ..
DUAL 1x4 (or 2x4) DMX splitter. 2 inputs with 4 outputs back access, or loop one of the outputs to t..
DMX 1x5 (1 in 5 out) splitter in a DIN rail/wall mount enclosure with screw terminals. 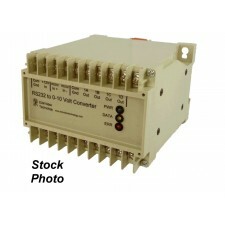 Power supply ..
DMX 1x4 (1 in 4 out) optical in splitter in a DIN rail/wall mount enclosure with screw terminals. Eq.. 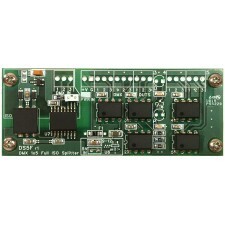 The DS5F is a full isolated 1 In 5 out splitter PCB. 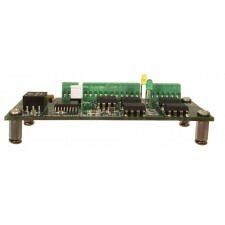 Accepts a DMX 512 input from any DMX generating..